Hildegard of Bingen (1098-1179), one of the most accomplished persons of the entire Middle Ages, finally has been officially declared a saint and is to be named a doctor of the church this month. She was a polymath with many roles, including those of scholar, scientist, botanist, ecologist, healer, preacher, writer, visionary, church leader and Benedictine spiritual guide. She sprinkled justice and compassion for the poor throughout her writings and composed chants with meditative melodies. She also painted mandalas, which are circles filled with colors, shapes and symbols. Making mandalas allows one to paint and pray at the same time. The process leads the painter to deeper levels of self-awareness and to the presence of God within. When I am in the throes of grief or overshadowed by doubts of faith, I also create mandalas. Instead of caving in to despair or allowing anger to consume me, I turn the energy of those emotions into something creative and life-affirming. The process helps me befriend the dark night that oppresses me and tell it that my faith, riddled with doubt though it may be, is alive and well. Making mandalas is a way to welcome growing pains, which eventually pass. When the going gets tough, an artist is inclined to create beauty, to turn grief and misery into inspiration and healing. These days, I feel like a mandala machine. When my attention turns from the miseries of church and state to consider which color works best beside another, then I know I am on a healing path where all will be well. Upon learning of Hildegard’s canonization, my first impulse was to paint a celebratory mandala of her and for her. 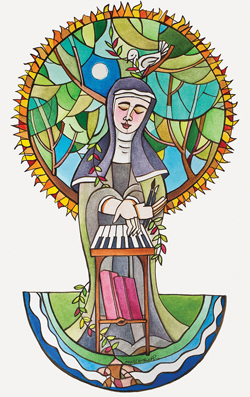 Hildegard’s writings, musical compositions and artwork evoke her own encounters with the green freshness of the Holy Spirit, so I placed her in the midst of verdant, abundant life. She coined a word for this, veriditas, which means eternal greenness, a concept in keeping with the contemporary emphasis on stewardship of the earth and all living things. Hildegard, like many scientists and physicists today, taught that we are all connected as one with a great cosmic God. Above, she stands at her keyboard beneath a tree of life with glimpses of the cosmos above and the depths below. Mystics teach that through encounters with nature, we best come to know the deep, high and wide presence of our incarnate God. Devoted to Kateri Tekakwitha ever since I learned her story as a boy, I am very excited about her canonization, also this month. I created a mandala in her honor with the help of Carla McConnell, an artist-friend, mentor and teacher. Divided into four sections, it is filled with Native American symbols of healing and abundance and was inspired by medicine wheels I discovered while researching American Indian spirituality. There is much to be learned about Jesus from those who have struggled extra hard to know him and to proclaim their message about him. These four women—Catherine of Siena, Teresa of Avila, Thérèse of Lisieux and Hildegard of Bingen—are true leaders to be admired and imitated. They communicated their experiences of God through the written word. Each had a momentous impact on the church’s spiritual life, which is one reason they qualify as doctors of the church. What I would give to have coffee with any one of them for an hour! Yet I am content to see them at my fingertips in living color, and I trust some of their courage may come my way through the act of painting them. They remind me that I am made in the image and likeness of God, not the other way round. Black Madonnas are ancient devotional images that recall the fertile soil, the contemplative quiet of caves and cathedrals, the nighttime sky. For me, nothing says “Incarnation and salvation” more clearly than a black madonna and child. The pearls of great price are somewhere deep within you, too, I am sure, waiting to be revealed in the light of day. The creative path is the best way to find these hidden treasures. I have painted dozens of them, each a prayer for God’s children wounded and excluded by society and the institutional church across time: women, gays, Jews, Protestants, Muslims, people of color, victims of abuse, divorced people—whoever has needed shelter in the arc of Mary’s wisdom and the abiding love of her son. Can we please put an end to this baseless and completely false notion that St. Hildegard of Bingen painted mandalas? They are an eastern prayer practice that was completely unknown to the Christian Middle Ages. St. Hildegard did not paint mandalas, nor did they have any place in her prayer life (which was centered on the Benedictine Opus Dei, the sung liturgy of the hours). What St. Hildegard did experience were visions in which certain geometric patterns recurred-combinations of circular and linear shapes, architectural features, and vivid alternations between light and dark, dazzling and subdued. The interplay between circular and linear was especially prominent in her third great visionary work, Liber Divinorum Operum, where it signified both the dynamic interaction of salvation history (linear) and eternal divinity (circular), and the relationship between the human microcosm and the created macrocosm of the universe. The images that illustrate these visions in the 13th-century Lucca manuscript of the work may <i>look</i> like mandalas, just as a mid-20th-century toaster may <i>look</i> like an iPad - but that does not mean that they are the same thing. Sometime in the last decade or two of her life, Hildegard supervised the creation of a deluxe illuminated manuscript for her first visionary work, Scivias, for which she designed the images. The visual dynamic of the circularity of eternal divinity intersected with the linearity of the Incarnation can be seen in the second vision of the second part of that work, of the Trinity. Hildegard described the vision thus: "Then I saw a bright light, and in this light the figure of a man the color of a sapphire, which was all blazing with a gentle glowing fire. And that bright light bathed the whole of the glowing fire, and the glowing fire bathed the bright light; and the bright light and the glowing fire poured over the whole human figure, so that the three were one light in one power of potential." In the illumination in the Rupertsberg manuscript, the bright light (of the Father) is shown in concentric circles of gold, the gentle glowing fire (of the Holy Spirit) in circles of silver, and the sapphire man (the Son) in the orans position in their midst. But again, this is not a mandala, for the simple reason that neither Hildegard nor any of her medieval counterparts knew anything about mandalas. Finally, it should be noted that Hildegard used the term viriditas, not veriditas, to describe the vital, creative, fertile, green power of God shared with the world in creation. Thank you so much michael for sharing these beautiful mandalas with us. your contribution is so inspiring to me. your mandalas are beauitful! love the representative symbols (e.g., the corn) and the abstract shapes together. I have always love Hildegard of bingen and am thrilled she is being canonized. And i didn't know about kateri and thea bowman. Now i have other strong catholic women to look up to. thank you so much. Thank you Michael for the gift of your artwork. I am uplifted by your creation of mandalas for saints. My mind's eye wanders over green hills, golden leaves, and blue morning glories, all in celebration of Our Blessed Mother. I realized too late that my earlier comment was rather intemperate and failed to recognize the extraordinary beauty with which Brother Michael has depicted these holy women in their unique relationships with the divine. As a devoted student of St. Hildegard, I sometimes react rather hotly at perceived sleights against her, without acknowledging that she can inspire others just as much as she inspires me. Thank you, Michael, for these humbly illuminating images! I want to thank Mickey for this beautiful window into the souls of of our great saints with the use of mandalas. I feel this art can help me to discover God's presence in all of life. This article also appeared in print, under the headline "Faith Circles," in the October 22, 2012 issue. Michael O’Neill McGrath, O.S.F.S., is an artist and author who lives and works in Camden, N.J. His latest book, Saved by Beauty (World Library Publications, 2012), is a visual journey with Dorothy Day.